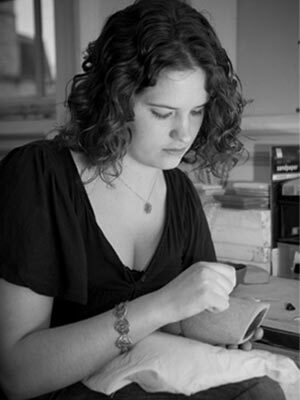 Ellen is currently finishing the last year of a degree in Contemporary Decorative Crafts at the University of Lincoln. She works mostly in stoneware using a variety of handbuilding techniques such as coiling, pinching and press moulding. Her work is both glazed and unglazed with occasional glass inclusions. Inspired by both the natural and man made patterns that surround us, from the obvious to the sometimes overlooked, Ellen interprets these themes into her work by drawing on or carving into the clay. Inspiration for her main collection is taken from the erosion patterns found in glacier caves. The ripple patterns are carved deeply into the surface of the clay and cast dramatic highlights and shadows as the light moves across them. The flowing lines are designed to be touched and followed by hand as much as by eye and the collection of smaller wobble pots are designed specifically to be held, to sit comfortably in the hand and to move and wobble as they are put down again.